Myanmar’s current government, led by the National League for Democracy, has persecuted journalists and restricted speech using the same laws and tactics previously employed its authoritarian regimes. Its political leaders must break from Myanmar’s repressive past by reforming laws that restrict the rights to freedom of expression and information and free all those imprisoned for exercising their rights, including jailed Reuters journalists Wa Lone and Kyaw Soe Oo. On 16 September 2018, approximately 100 journalists, activists and others held a peaceful protest in Yangon to call for the release of the Reuters reporters Wa Lone and Kyaw Soe Oo, greater protections for journalists, and the reform of laws used to restrict the rights to freedom of expression and information. Protesters held signs expressing their demands, performed skits dramatizing attacks on media freedom, and released balloons with the message, “Free Wa Lone and Kyaw Soe Oo”. After initially rebuffing organiser’s request for permission to hold the protest, authorities assented on 15 September and the event was held without incident. ARTICLE 19 stands with the brave journalists, activists and concerned citizens who are demanding greater freedoms and respect for rights in Myanmar. Their courage in the face of repression should catalyse those desirous of a more just and open future for the country. In particular, Myanmar’s political leaders should heed the protesters’ calls and take steps to ensure justice and the free exercise of human rights for all. Although ARTICLE 19 commends the Myanmar government for allowing the 16 September protest to proceed, ARTICLE 19 regrets that it has failed to reform the Peaceful Assembly and Peaceful Procession Act to ensure compliance with international human rights standards, and instead has used the law to violate the right to protest. In particular, ARTICLE 19 maintains that the Myanmar Government should not impose prior-authorisation requirements, but should at most require notice of protests. Notification procedures should be subject to a proportionality assessment, should not be unduly bureaucratic, and should require no more than 48 hours notice prior to a protest. On 3 September 2018, Wa Lone and Kyaw Soe Oo were convicted under the Official Secrets Act and sentenced to seven years imprisonment for their role in uncovering a massacre of Rohingya men and boys my Myanmar Army soldiers. The two men were arrested shortly after being handed a set of documents by police officers. The court ruled against Wa Lone and Kyaw Soe Oo despite the fact that seven soldiers had already been imprisoned for their role in the massacre. During the trial, the court heard evidence—including from a police whistleblower—indicating that the two journalists had been targeted in a poorly concealed entrapment plot authorized by senior police officers. The Official Secrets Act is one of numerous laws—many originating from the British colonial era or the subsequent decades of military rule—that unduly restrict the right to freedom of expression and information in Myanmar. 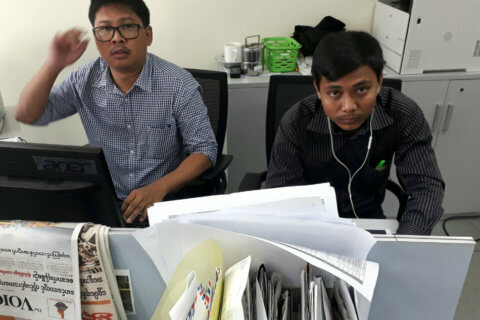 Specifically, laws governing the media sector, including the Broadcasting Law, Printing and Publishing Law and News Media Law, undermine the development of a vibrant and independent press in Myanmar. Other laws that unduly restrict the right to freedom of expression and information in Myanmar include the Telecommunications Law, Unlawful Associations Act and various Penal Code provisions. ARTICLE 19 calls for the immediate and unconditional release of Wa Lone and Kyaw Soe Oo. Moreover, the Myanmar government must immediately take steps to ensure a safe and enabling environment for journalists to investigate and report on matters of public interest. The government must refrain from all further prosecutions of journalists for their reporting work or exercise of the right to freedom of expression. ARTICLE 19 also calls on the Myanmar government to immediately undertake a comprehensive programme of legislative reform to bring all laws into line with its obligations under international human rights law as well as applicable human rights standards.